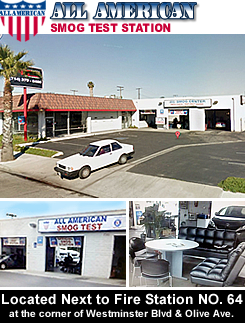 $24.75* Westminster Smog Check Coupon - All American Smog Test - 7301 Westminster Blvd. Unit B, Westminster, CA. Phone: (714) 901-7202. Local Westminster Smog Station. Great location, great service, great price... We're All American Smog Test in Westminster, eager to earn your business. BAR certified to smog check all vehicles. Offering a comfortable and clean environment to relax in while we inspect your vehicle. Take advantage of Free Wi-Fi in our waiting room with full view of your vehicle at all times. Shop Hours: MON-FRI 8:30am to 5:00pm. SAT 9:00am to 3:00pm. SUN Closed. Smog Special: Only $24.75* plus $8.25 CA cert. (only when your vehicle passes). Please call for 1999 & older vehicles. Free Retest: Get one (1) free re-test if needed. We want you to pass the first test! *Trucks, Vans and SUVs $34.75*. 2000 & newer only.